We honor our colleague and friend, Jon, who passed April 6, 2010. His contributions, appreciatively woven into the CWI website, remind us of his significant and continuing influence as we seek to deepen our understanding of collective wisdom. How can spirit be evoked in any organisational setting regardless of culture? What I mean by spirit, in this sense, is the event when something happens to a group that occasions an image, a feeling of awe (the simultaneous precognitive experience of fear and fascination), and an act of will and leaves a kind of residue. I was a team leader for a community development project in a village called Pace in Mississippi. Pace is about 10 miles from where the three civil rights organizers were killed 10 years earlier. The village was mostly black with a few rich white farmers. Members of both communities supported the idea of the project but there was tension. On the third day about 100 people were sitting in a large hall waiting for the plenary to begin. As the starting time passed and then an hour and then an hour and a half, we became more and more restless. We sang songs and told jokes. One of the white rich farmers and a black teacher came into the hall and to the front of the room. They explained that a dilapidated building owned by the farmer and collapsed and killed the high school aged niece of the teacher. The girl had taken off from school to attend the consultation. She died on her way to the meeting. Silence filled the room. Images ran through my mind and a jumble of emotions ran through me: remembering the beautiful young woman, fear that an already tense situation could become dangerous, sorrow for the mother, concern about the rest of the group, a picture of the old buildings in the block long business district and many others. The aunt then said that the funeral was to be held on the coming Saturday. It was to be attended by members of the community only. The girl’s family were together and doing as well as could be expected. The farmer had taken a tractor and destroyed the rest of the old building. She then said that the girl’s mother wanted the consultation to go on. It was too important to be stopped. In this tragedy something magical had happened. Facilitating groups to reach agreement about a plan or to make a choice is a very exciting process. Spiritually groups sometimes just do miraculous things. Things that you should expect them to be able to do. Occasionally, a group will really spark, a difficult situation will be overcome, a new innovative idea will emerge, a new commitment will develop. Facilitation of group decision-making processes is part of a very long-term trend toward involving people in decisions that affect their lives. I usually start with the Magna Carta through the French and American Revolutions, the suffragettes, the turn of the century labor movements to the present day. I am pretty sure the experiment with representational democracy is in the process of ending and a more direct form of decision making is taking its place. Finally, group dynamics are amazingly complex and interesting just to observe. They are unpredictable. They have a huge capacity for fun. They can be tender and caring and mean spirited and destructive. I joined the Ecumenical Institute in Chicago in May 1968. The Institute (now the Institute of Cultural Affairs) developed social models and methods. These were used in local community development projects in many countries around the world. They also developed maps and guides to spirituality. The first one I worked on is "The Other World, in the Midst of This World", a description of 64 states of consciousness. The second is "The New Religious Mode" which is the basis of the work on what I am calling the “Interior Disciplines of Facilitation”. They also developed techniques for enabling people to become aware of the spiritual dimension of life. Until 3 years ago, I had not written or developed programs about spirituality for about 10 years. Although, I tell stories and they are related to the spiritual. When I attended a conference put on by the Center for Generative Leadership, I felt compelled to return to this work. At the same time, I am quite concerned with the development of facilitation as a profession, which in turn relates to spirituality in organisations. I found the conferences that Center for Generative Leadership very helpful. The opportunity to meet face to face with a group of like minded people and dialogue about these issues was important for me. 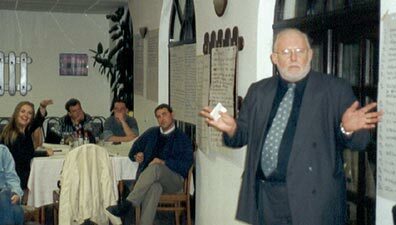 I found Claus Otto Scharmer's presentations very useful. I belong to several online groups who sometimes touch on these issues. It might be interesting to create such a group. I am most often available via e-mail all the time. I travel to the US a couple times a year and could be available around those visits. My wife and I have developed a retreat on the Internal Disciplines of a Facilitator and could give that to a group. The Union of International Association - They have a great deal to say about world problems and human potential. The International Association of Facilitators - The IAF provides a number of insights on group work. John Epps article on the meaning of work is one such. The Co-working Institute - This site was originally created by Bernie Dekoven and now maintained by Gerrit Visser. It is largely focused on the technical aspects of co-working but is not limited to this area.